Omadhebo has helped popularize Afrobeat locally. Geoffrey Omadhebo has drummed in some of the most famous Afrobeat bands, including The Nigerian Allstars and Sonny Okosuns. He grew up practicing in front of Tony Allen and Fela Kuti, the fathers of Afrobeat, because his sister was a dancer for Fela. 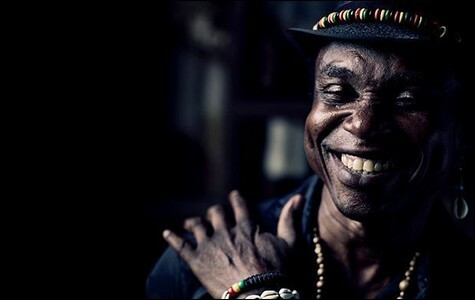 When he moved to the United States from his native Nigeria in 1985 to tour with The Nigerian Allstars, he slowly made the transition from drummer to principal songwriter in various Afrobeat groups. In the process, he helped make the Bay Area the birthplace of American Afrobeat. Three years ago, Omadhebo formed Lagos Roots Afrobeat Ensemble with Babatunde Williams, Kuti's legendary trumpet player. Today, the ensemble is one of the most successful Afrobeat bands in the Bay Area, driven, in part, by the popularity of electronic music, which has helped usher in a new wave of interest in Afrobeat music. "There's monotony in Afrobeat, because it's based on jazz and highlife, which are social bands," Omadhebo said. "In an Afrobeat band, everybody holds it down to let the horns work." Afrobeat bands are largely composed of many musicians playing the same one or two chords over and over again. The exception is its horn section, which is the largest and most dynamic section of the band; musicians are encouraged to perform long solos and improvise. Underneath funky guitar parts and jazzy horns, percussionists beat out African rhythms. For Greg Waters, one of Lagos Roots' guitarists and saxophonists who also leads the ensemble's horn section, that monotony can become hypnotic: "When there are that many people on stage, there's an energy that excites the crowd," he said. "I do love listening to Afrobeat recordings, but you have to experience it live for that to settle in. At our shows, there are people who know Fela, who know Afrobeat, who are into funk and soul, but also people who are into electronic stuff and the trance-y atmosphere of the music." Omadhebo said the East Bay has a particular culture of diversity and acceptance, which attracts the most talented musicians. "There are more cultural collaborations here in the Bay than in another part of America .... That's why world beat music started here," he wrote in an email. When Lagos Roots perform, there may be as many as eighteen people on stage, but some of them are relatively new to the genre. Adriana Marrero, who sings backup vocals and plays the shekere, a West African gourd rattle, wasn't familiar with Afrobeat when Omadhebo invited her to join the group after watching her sing. But since joining the ensemble, she listens to Kuti's music every day. "It's amazing because once you get to know Fela's story, working with someone like Geoffrey feels like working with an extension of Fela," she wrote in an email. "He was a musical genius." Waters joined the group after looking for an opportunity to play more sax and answering its Craigslist ad for a horn section. A longtime fan of Kuti, Waters was stunned when he realized that he was about to audition for some of the genre's stars. The ensemble once included well-known Afrobeat players like Tutu Shorunmu, Christy Agbe, Candido Obajimi, and Friday Jumbo. When I met the ensemble in its rehearsal space in East Oakland, it was gearing up for its third annual headlining performance at The New Parish to celebrate the birthday of Fela Kuti. 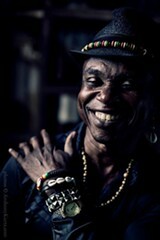 "Felabration" has sold out the past two years. At this year's event, Lagos Roots will also release a new LP with four of Omadhebo's original tracks. His lyrics are politically motivated and written in West African Pidgin English, which is traditional of Afrobeat..
"When it comes to Afrobeat, there are few love songs," Omadhebo said, laughing. "The way Fela created it, it is about freedom and justice — political ideas." The ensemble's powerful, heart-rattling music demands attention, but it's also celebratory. Afrobeat emerged from Western Africa in the 1970s. It's impossible to talk about Afrobeat without referencing Kuti. Fela, as everyone refers to him, was a political activist and larger-than-life idea man, the first person to blend African rhythms with James Brown-style soul and Western pop, which were flowing into Nigeria at the time. His legacy continues to loom large. "Without Fela, there would be no Afrobeat," said Ritwik Banerji, one of the ensemble's saxophonists. Lagos Roots continues with that spirit. Jason Perkins, the co-owner of New Parish Entertainment group, said that he let Lagos Roots curate the entire lineup at Felabration. "These guys are one of the best Afrobeat bands I've ever seen," he said. "They bring it. It's packed and sweaty ... people dance all night." Danjuma Adamu, an original Afrobeat musician who has played with Kuti and is from Lagos, Nigeria, will be performing with his band Onola, in addition to the Jaara Dance Project, a contemporary African dance ensemble from San Francisco.